So, you’ve decided to embrace the Future (or is it actually the Past?) and moved into a Mid-Century Modern living space? Great galaxies!!! That’s just swell! You love the clean lines, bright open spaces, the futuristic optimism, that color combo of warm pastels and earth tones, even those goofy, "what-on-Earth-were-they-thinking?" details. You’re shopping for modern-looking furniture and fixtures to fit, perhaps even outdoor chairs and planters. What about the plants? How would you fit your garden into a Modern setting? What works well with "The Look"? For the uninitiated, Mid-Century Modern (aka, Retro Modern) is the style of architecture, furniture, household goods and many other areas of design, which emerged in the 1930s, but peaked in the late 50s - early 60s. It illustrated our society's look toward a brighter future after The Great Depression and World War II. Sources of inspiration included The Bauhaus School, Japanese architecture, Frank Lloyd Wright, and Space Age technology. It has reemerged in a big way over the last decade. New and refurbished houses, condos or apartments evoking Mid-Century Modern are popping up all over Puget Sound, as well as the U.S. Fans and detractors of the style may assign credit/blame to the popularity of Mad Men, Dwell magazine, or us baby boomers who fondly recall Googie architecture, The Seattle World’s Fair, or at least, The Jetsons. But love it or hate it, it's a hot trend and probably going to be here a while. • Plants with a clean, architectural or geometric character. • Plants with a sculptural, futuristic or whimsical shape or character. • Plants which evoke the color of the period. Granted, this is more of a visual/architectural, than an environmental/sustainable approach to the landscape. If "clean minimalism" is indeed your goal, some regular pruning, watering or fertilizing is necessary to control plant size and health (even though our list focuses on lower-maintenance plants). However, your garden may not be as diverse and pollinator-friendly as native-oriented or cottage gardens. You may certainly create a more sustainable landscape, or bring in rambling, spreading plants to soften or counterbalance all the hard edges and angles. But this plant collection is meant largely as an extension of the architecture. Also, note that these are not necessarily species or varieties from that era. In fact, many were not yet hybridized nor readily available to homeowners in the 1950s. So this list is not about authentic reproductions, but rather achieving a certain look with contemporary plant materials. Plants with a clean, architectural or geometric character. These might be planted in a straight line or other orderly configuration. 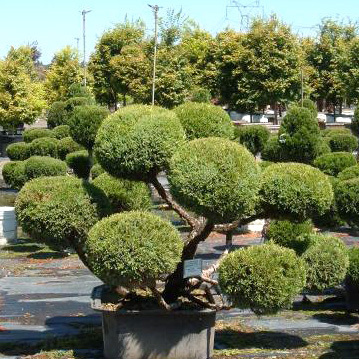 Some require regular shearing or other pruning to keep their shape, but they shouldn't need constant manicuring. Bowling, anyone? Irish Yew (Taxus baccata 'Fastigiata') - Yews are among the most versatile hedging shrubs: slow growing in sun or shade, can be pruned almost any way you'd like. Juniper 'Skyrocket' - Fast growing (to 15-20' tall) but narrow, shrub for a sunny space. 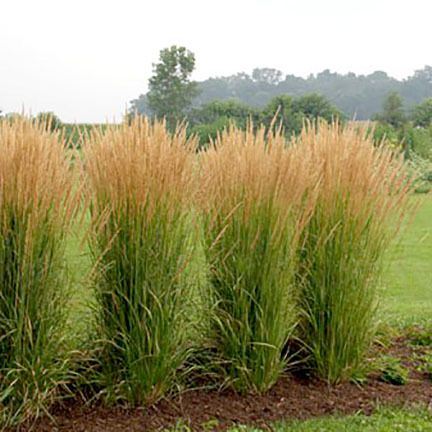 Feather Reed Grass (Calamagrostis ‘Karl Foerster’) - The upright, narrow habit of seedheads make this a more formal-looking deciduous grass. also: Fineline® Buckthorn (Rhamnus frangula 'Ron Williams'), Italian Cypress (Cupressus sempervirens), Wilma Goldcrest Cypress (Cupressus macrocarpa 'Wilma Goldcrest'). 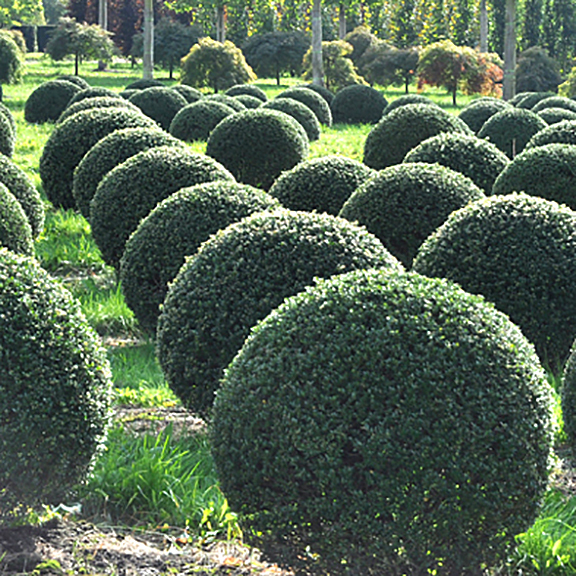 Japanese Holly (Ilex crenata) - Similar texture to the traditional boxwood but a darker, glossier green. Dizzying array of shapes and sizes, from the tiny, round 'Helleri' to the tall, narrow 'Sky Pencil.' But all are easy to grow and prune. Hebe - Mounding shrubs with fascinating foliage textures and summer or fall blooms. Favorites for a clean look: H. 'Red Edge,' H. mckeanii, H. sutherlandii. Lavender (Lavandula) - Can be rambling but most assume a soft rounded shape when lightly sheared twice a year (early spring and after blooming). also: Boxwood (Buxus), Barberry (Berberis), Spiraea. Creeping Thyme (Thymus) - Walkable, drought-tolerant groundcover with great fragrance. Stonecrop (Sedum low species) - Drought tolerant champ, the standard for roof gardens. Wide array of varieties. Mondo Grass (Ophiopogon) - Dense, grass-like groundcover for shadier locations. 'Nana' is lowest, Black Mondo Grass (O. p. 'Nigrescens') is a color favorite. Plants with sculptural, futuristic or whimsical shape or character. Extra credit if it looks vaguely extra-terrestrial or interplanetary. 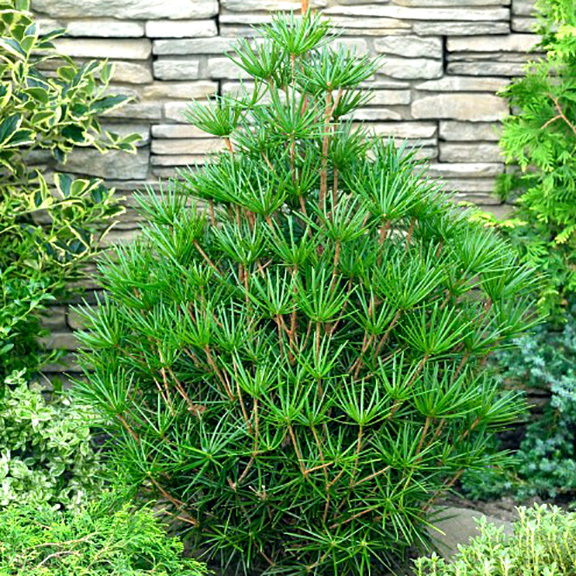 Umbrella Pine (Sciadopitys) - Prominent, glossy, round-tip needles and a slow, symmetrical habit make this a favorite conifer for small spaces and containers. 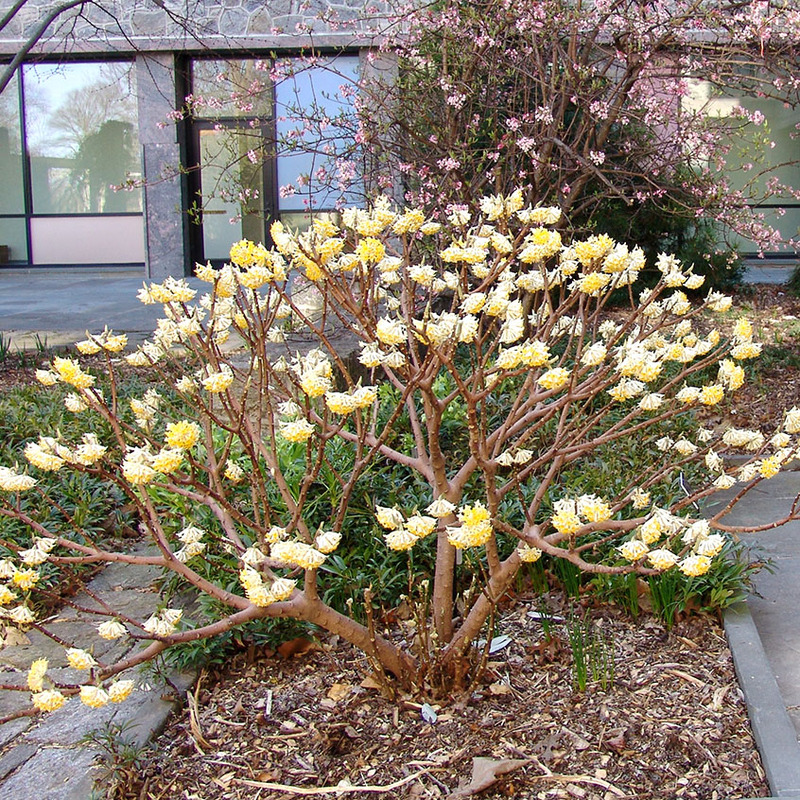 Paper Bush (Edgeworthia) - Open-branching Daphne relative with exotic, fragrant, yellow & white flowers on bare branches before tropical-looking leaves emerge. Topiary Junipers (and other species) - Limited only by your imagination and pruning schedule! also: Lions Head Japanese Maple (Acer palmatum 'Shishigashira') - Among all the amazing Japanese maples you could use, this tiny-leaved variety is one of the more sculptural and well-suited for small spaces. Giant Feather Grass (Stipa gigantea) - Fairly anonymous-looking green clumping grass which dramatically sends up seed heads to six feet tall in summer! New Zealand Iris (Libertia) - Perennial with colorful sprays of leaves accented by dainty white flowers. Or consider its visual relatives: Iris, New Zealand Flax (Phormium). Blue Oat Grass (Helictotrichon sempervirens) - Think big (18-24"), blue tribbles with multiple antennae. Lily of the Nile (Agapanthus) - Perennial with exotic stems of bursting starlike blooms. Red Hot Poker (Kniphofia) - It doesn't get more rocket-like than this. All in flaming colors. For sunny, dry locations. Ornamental Onion (Allium) - Floating planets or satellites swaying in the breeze. Diggers Speedwell (Parahebe perfoliata) - Arching perennial for drier settings, makes a spacey fashion statement. Hen & Chickens (Sempervivum) - Perennial for sunny dry places. Could be renamed "Stars & Planets" for our purposes here. Scouring Rush (Equisetum hyemale) - Upright, living sculpture for a contained, watery planter. 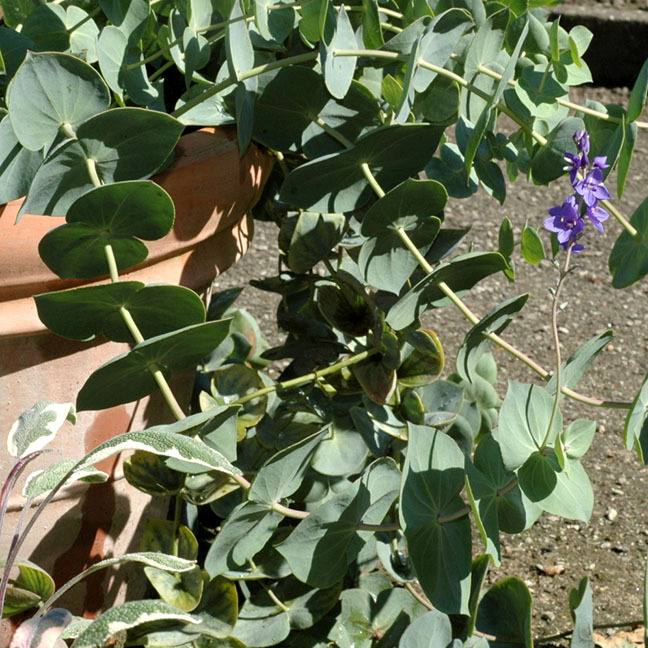 Plants which evoke the color of the period. How do you match that couch? 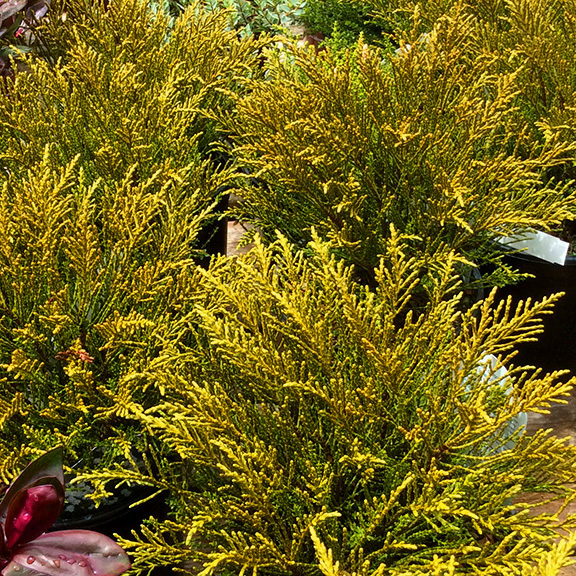 Hebe ‘James Stirling’ - Low shrub with yellow-green, scaly foliage which turns a unique ochre color in fall and winter. Coneflower (Echinacea) - The dark orange varieties of these perennials take me back to the original color of the Space Needle. Pink Stonecrop (Sedum cauticola 'Lidakense') - Flowers are hot pink, but that aqua foliage through the rest of the year sets the tone. Heuchera 'Marmalade' - Perennial for part shade, a peachy favorite among the orange-hued Heucheras. Blue Sea Holly (Eryngium) - Perennial for drier, sunny places, looks like it's "Not Of This Earth"... but really, it is! 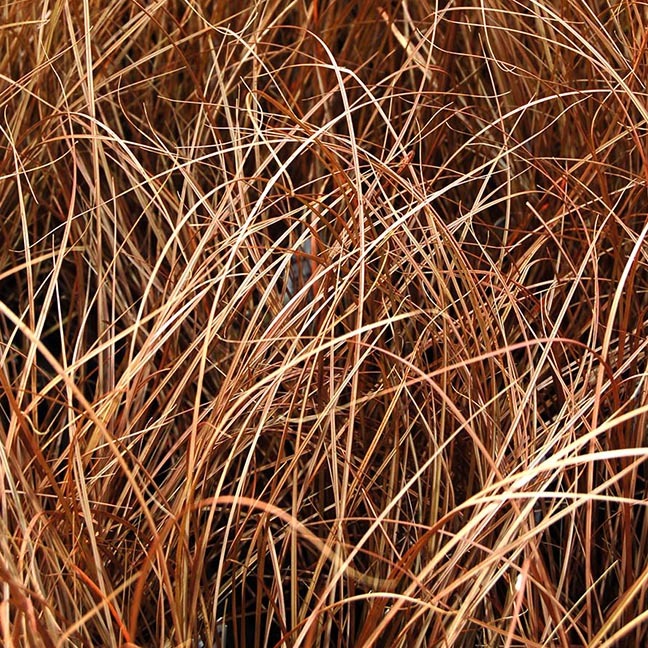 New Zealand Weeping Brown Sedge (Carex flagellifera) - Love that bronzey color year-round, as we also do for C. 'Cappucino' and C. buchananii. This is certainly not an exhaustive list, and availability of individual varieties will vary through the year. But perhaps it will give you the launch pad to help your garden achieve Stylistic Lift-Off! Or, at least, a little Modern respect.